Bridge Is Part Of Lorell Essentials Series Laminate Furniture With High-Quality Laminate Construction And Metal-To-Metal, Cam-Lock Connections. Use The Bridge To Connect Desk And Credenza Units Smoothly Into L-Shaped Or U-Shaped Configurations To Make The Most Efficient Use Of Your Office Space. 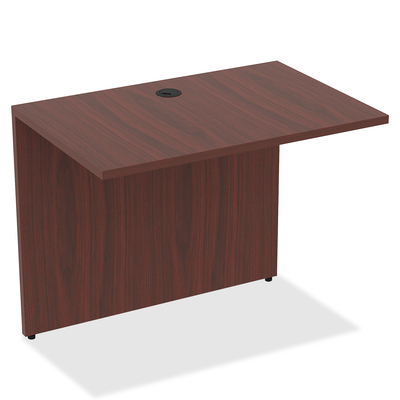 Mahogany Laminate Top Is 1" Thick For Durability. Use The Grommet Hole In The Top And The Back Panel For Easy Cord Routing. Design Also Includes 3mm Pvc Edges And Full Modesty Panel For Privacy..
Bridge Is Part Of Lorell Essentials Series Laminate Furniture With High-Quality Laminate Construction And Metal-To-Metal, Cam-Lock Connections. Use The Bridge To Connect Desk And Credenza Units Smoothly Into L-Shaped Or U-Shaped Configurations To Make The Most Efficient Use Of Your Office Space. Mahogany Laminate Top Is 1" Thick For Durability. Use The Grommet Hole In The Top And The Back Panel For Easy Cord Routing. Design Also Includes 3mm Pvc Edges And Full Modesty Panel For Privacy.